There was a time when installing Linux on one's machine was a chore and involved opening up the case and collecting information about the various hardware components attached to the motherboard such as finding what chipset was used in a particular PCI card. I remember having to open the case and check the chipset used in my internal dial-up winmodem to get it to work in Linux. And I am happy that it was hard because most of my knowledge in hardware was gained in the process of trying to get many of the devices to work in Linux. And I concede I failed a number of times but each time I tried to install Linux and get it to work on my machine, I learned a bit more about my system. Now a days, installing Linux has become child's play. Almost all the devices are detected out of the box and if at all you need to open up the case, it will be for upgrading or to troubleshoot any hardware problems. But it always helps to have some understanding about the various parts which constitute a motherboard as well as be aware of certain inherent drawbacks that certain mother board designs have. 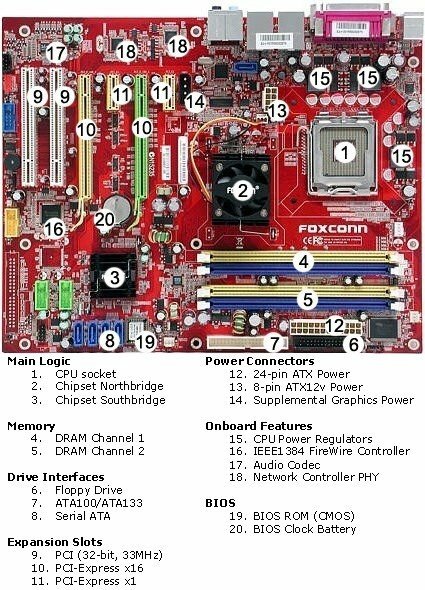 This comes in use at the time of purchasing a computer and will help in buying one with the most suitable and efficient motherboard design. Thomas Soderstrom at Toms Hardware has written an excellent article which explains the process of motherboard selection. He starts with the motherboard component overview and goes on to explain the layout considerations, choosing the right foam factor, the different socket types used by different processors as well as the bios features. This article is replete with images of the motherboard and the socket types. It is no doubt an indepth article and a must read for anybody interested in knowing more about ones computer. Ars Technica also has a good article on motherboards, here.